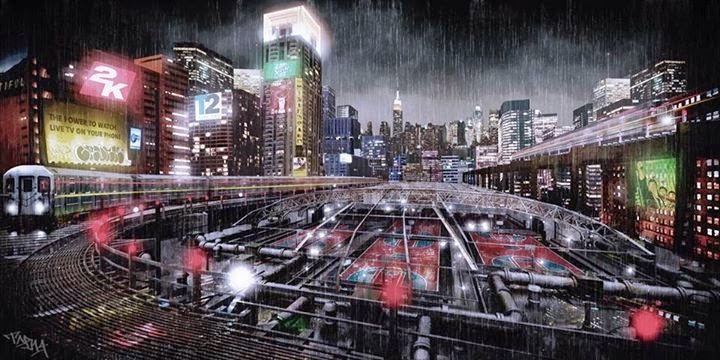 In NBA 2K14 The Park was first unveiled. 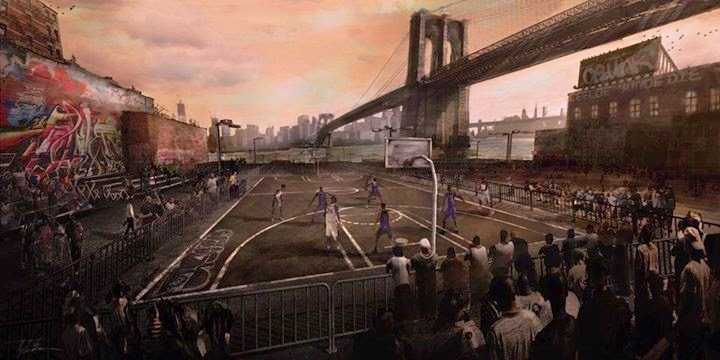 It was the first iteration of a revolutionary mode unseen in any sports game, bringing MyPLAYERs together to play casual games of street ball. This year, the world is getting bigger and the stakes higher. The Old Town Flyers, Sunset Beach Ballers and Rivet City Rough Riders are recruiting true competitors to represent their community in NBA 2K15’s MyPARK mode. 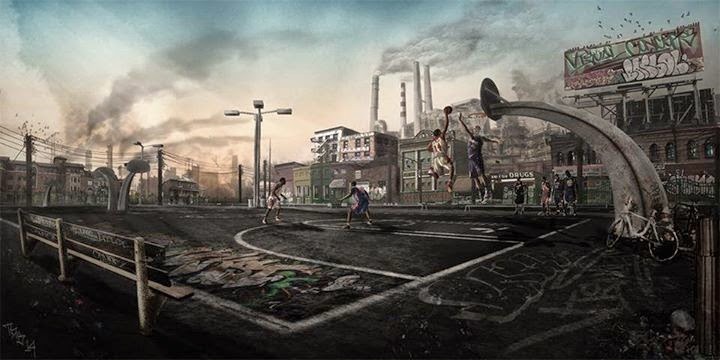 Each affiliation has its own 8-court home park and unique flavor of basketball emphasized by slight boosts to various aspects of your game. Pledge your loyalty to one and start making a name for yourself. The Old Town Flyers are all about looking good on the court. They like the flashy passes and Size-Ups. They’re also tight defenders that may lead to quite a few fast breaks capped off with an alley dunk. The Sunset Beach Ballers are all about scoring. From layups to midrange jumpers to long threes, these players cannot be left open for 1 second. The Rivet City Rough Riders are the physical type. What they don’t swat out of the air will end up being rebounded. And on the offensive side of the ball, stay clear unless you’re fond of being posterized by a slam so hard it’ll shake the screen. With that said, can you be a shooter in Rivet City or a big in Sunset Beach? Most definitely! The boosts you receive are meant only to be complimentary to areas you may be focused on. They will not make you dominant in any discipline. Now that you’ve selected your home park, get out there and win! As you do, you will earn a reputation for yourself. MyPARK Rep is an earned-only feature which takes into account not only wins, but your teammate grade and opponents. There are 4 major Rep levels with 3 sub-levels earned in each. You start out with as a Rookie 1 and can rise through the Pro and All-Star ranks up to the top-tiered Legend 3 Rep level. As you rep increases, you will unlock various MyPARK-specific abilities, animations and clothing. If you’re thinking of traveling to one of your Rivals’ parks, you’ll need to be at least a Pro 3. When you do travel, your VC is doubled for defeating Rival parks. If you cannot travel or simply choose not to, defending your home park against Rivals will earn you a significant Rep bonus. You can also lose Rep with a poor teammate grade, quitting games or even losing on a Rival park’s court. From October 11th through to the weekend preceding the NBA All-Star game, the MyPARK Championship will pit all 3 affiliations against one another in weekly rounds of competition. All travel restrictions are lifted during the events. After each round, the winning park’s participants will be awarded prizes such as VC, Rep bonuses and exclusive accessories with attribute boosts. The 1st place park will earn 2 points for the round and 2nd place 1 point. These points count towards the MyPARK Championship where the park leading at the end will win a newly designed park to call home! Now street ball isn’t for everyone. There are those of us that prefer the sound of the ball bouncing on a hardwood court floor, the rush of a 4th quarter comeback, referees and rules... we’ve got you covered. 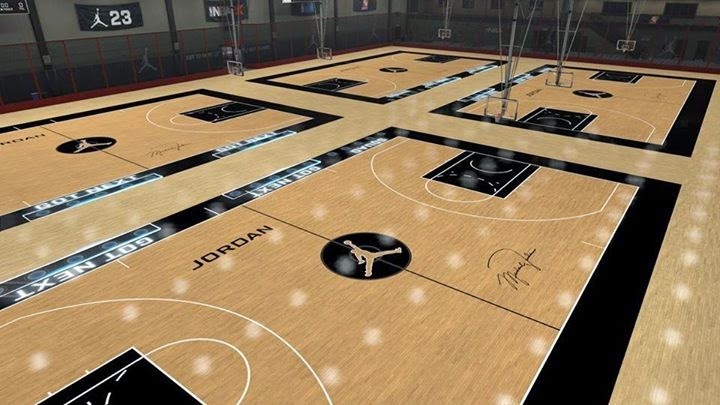 The Jordan Rec Center features four full-sized courts featuring 5-minute quarters of 5v5, NBA rules basketball. Games played here count towards your MyPARK Rep and towards the MyPARK Championship. That sounds great and all, but you just want to play with your friends and that wasn’t easy to do last year. Whether you prefer playing on hardwood or the blacktop, we have made playing with friends on the same team simple with our new Squads feature. No more racing to call Got Next before a random player ruins things for you. Form a Squad with anyone currently in your park by viewing the list of players and sending them an invite. Once you have your team together use any designated Squad area located on each court. When that game is over you will all step onto the court together as a Squad to start your run. With the new Attribute Upgrades feature, you will no longer see a park full of 99s that are impossible to guard. Players must make choices how to upgrade their MyPLAYER becoming specialists in certain disciplines. MyPARK games have been shortened to 15 points. This along with the added 8th court will shorten up Got Next wait times. We’ve added an always-on game score overlay! No more running to a spot on the court or changing camera angles to find out the current score. We’ve added the teammate grade meter so you know how well you’re playing at a glance without having to bring up the game menu. The MyNBA2K15 mobile app makes it easy to send texts to your squad or anyone in your park. Just type on the app and the text pops up on their screen. Matchups are now based on height with weighting for position rather than simple join order. 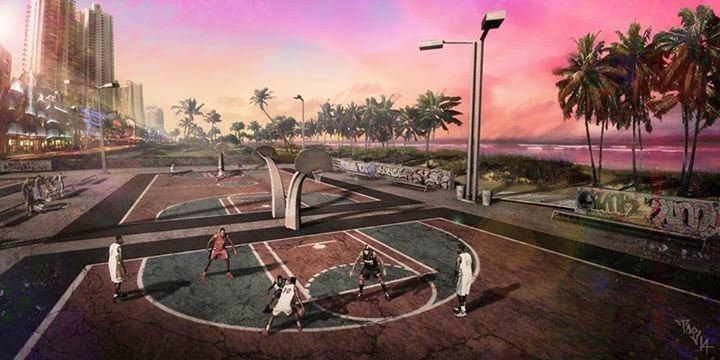 The familiar park layout of 2K14 makes its return on the rooftop of a building located in the heart of the city. This is a neutral site where the love for your park is set aside for your love of VC. It’s time to put your VC where your mouth is. Step up to one of the courts and Ante-Up the amount of VC displayed. Win and you split the pot with your team. Lose and you’ll be walking off the court with lighter pockets. Squads are supported here as well. For those of you that enjoy high-stakes gaming, we have the High Rollers area with Ante amounts up to 30,000VC or higher for a single game! The Stage will be exclusive for the PS4 version for the first 30 days. It will be available on all platforms starting November 8th. NBA 2K15 is set to launch on October 7th 2014 and will be available on the PlayStation 3, Xbox 360, Xbox One, PlayStation 4, and Windows PC.